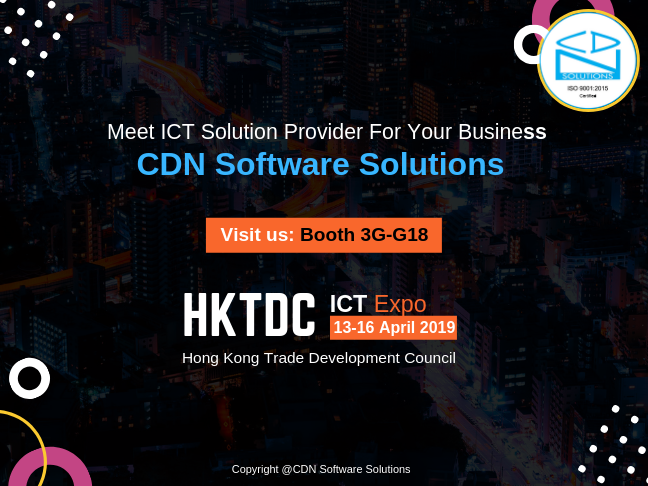 We at CDN Software Solutions are all set and excited to participate in the HKTDC International ICT Expo 2019 for the 7th time. Once again we are gonna exhibit at the event, going to be held in Hong Kong from 13th-16th April 2019. This year, we would be at stall G18 Hall 3G. At the expo, we would showcase our trending services and innovative custom solutions. It would not only keep you ahead in the competitive digital age but also improve your business productivity and profitability. You can find CDN Software Solutions in the list of companies exhibiting in ICT Expo 2019. HKTDC Int’l ICT Expo is a leading event that connects technologists, visionaries and business leaders with expert ICT solutions and services providers to help accelerate businesses. The expo is going to be held at the Hong Kong Convention and Exhibition Center. This is a four-day event which will commence on 13th April and last till 16th April 2019. This year over 3500 exhibitors and 98,000 buyers from around the world are going to take part in the event. If you are attending the show, we invite you to our stand G18 in hall 3G to explore Global ICT solutions for your businesses! These are some of the solutions and services CDN Solutions Group expertise in and will showcase at the event. If you expect to find solutions for your businesses at the expo, find us at Booth 3G-G18 in Group pavilion any day from 13th-16th April 2019. We would make sure to provide you with the solution that best suits your requirements. We are available to meet you at the event and can even catch you for a coffee or lunch. Schedule a meeting in advance with CDN Software Solutions team of IT experts or direct visit us at our Stand G18 in HKTDC.